"Somewhere along the way, [the UFC] forgot that the product that they are selling is the fighter, and that they have to take care of that product, and that they have to put out a good product by making sure that those people can focus on their jobs and not getting sponsors and things like that." It’s pretty rare to see an analyst who’s also an active athlete, but that’s shown up a few times here and there with analysts who are injured (Greg Olsen), not playing on the particular day (Tim Howard), or even briefly coming out of retirement (Dale Earnhardt Jr.). It’s maybe even more unusual to see someone broadcast part of an event they’re also competing in, though, and that’s what Sean O’Connell did twice earlier this year in the Professional Fighters League. O’Connell, who competed in several UFC fights between April 2014 and December 2016, signed with the PFL this year, and called preliminary fights on Facebook Watch before competing as part of the main card in PFL 2 (in Chicago in June, where he beat Ronny Markes by TKO; he’s seen above in a still from his post-fight press scrum) and PFL 7 (in Atlantic City in August, where he lost to Bazigit Atajev by TKO). He’ll be fighting in the PFL’s second of three playoff events, PFL 9, which takes place Saturday in Long Beach. Winners there must win two fights on the night, and they’ll will move on to the finals in New York City on New Year’s Eve, where a $10 million purse will be paid out across six weight classes. Ahead of PFL 9 (which will be broadcast live on NBCSN in the U.S. beginning at 9 p.m. Eastern Saturday, and broadcast on Facebook internationally), O’Connell spoke to Awful Announcing about what it was like to call a match and then fight, what’s ahead for him on the broadcasting side, and what the PFL experience has been like so far. He said broadcasting and then fighting was a great experience. O’Connell said broadcasting was a good way for him to not dwell on his upcoming fight. In fact, he said fighting wasn’t really on his mind while he was calling matches. 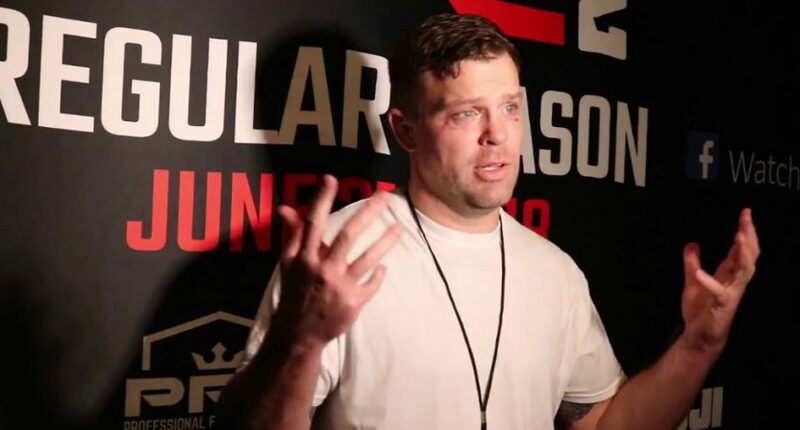 O’Connell said while it’s unusual to be specifically broadcasting and fighting in the same night, that kind of mental separation is relatively common for fighters. He said his PFL 2 fight was particularly important, as it showed that he could handle doing both roles in one night. Analysts often have to walk a tough line when it comes to fair criticism of competitors, and that can be particularly tough for those who have competed recently themselves. It’s maybe even tougher for someone who’s still actively competing. But O’Connell said he deals with that by making sure what he says isn’t personal, and by considering how he’d react to on-broadcast criticism of his own performance. O’Connell won’t be on the call on Saturday’s broadcast thanks to the way it’s set up, with the two fights in one night meaning there aren’t long layoffs. But he was a broadcaster before getting into fighting, doing radio shows in San Francisco and Utah (one of which helped him get into the UFC, after he surprised Dana White with a contract request mid-interview), and he’s had other media experience as a (sci-fi novel) author. He said his broadcasting stints this year have perhaps paved a way for a future career on that side. He said MMA broadcasting is an area he’s been trying to get into for a long time, and one he might transition into more fully next year. O’Connell’s been involved with many different MMA promotions over the years, from smaller early ones to the UFC to the PFL. He said he’s very appreciative of how the PFL treats its fighters, especially in comparison to the UFC. O’Connell said he thinks that approach will pay off for the PFL in the long term. PFL 9 takes place Saturday in Long Beach, and will be broadcast live on NBCSN (in the US) and Facebook Watch (internationally) beginning at 9 p.m. Eastern.